Last month, ocean scientists put new biotechnologies to the test -- performing the first-ever DNA sequencing at sea. Over the course of a 17-day research cruise aboard the research vessel Atlantis, scientists sequenced just under 2 million base pairs of DNA from different microbes and organisms that live in and around deep-sea hydrothermal vents. "What we're trying to do is actually link the organism and its genetics with the environment," says Craig Cary, a marine biologist at the University of Delaware and the research team leader. Cary's team conducted daily dives aboard the submersible Alvin into the waters some 1,200 miles off the coast of Costa Rica to collect microbes, tubeworms, vent crabs and other life forms that thrive in vent environments reaching temperatures of 750 F. Of particular interest to their research is the Pompeii worm. 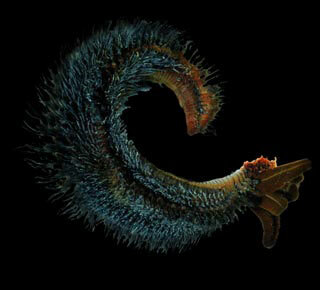 Covering the worm's back, Cary says, is a "fleece of bacteria." These microbes may possess heat-stable enzymes useful in a variety of applications, such as pharmaceutical production, food processing, paper and textile manufacture, and hazardous waste cleanup. "The sequencing that we're doing and that will be done continuously was really to understand how geochemistry is motivating and moving the bacterial community," Cary says. Previously, studying these extreme, deep-sea environments proved difficult, because of time and technological limitations in the field, Cary says. But now, with the MegaBACE 1000 DNA Analysis System and the TempliPhi DNA Sequencing Template Amplification Kit from Amersham Biosciences, they "were able to break a barrier that had always been in place" to analyze the specimens' DNA as Alvin collected them and brought them up to the surface. Two scientists from Amersham Biosciences conducted the DNA analysis using the company's sequencing systems, the same technologies used in the Human Genome Project, but with some added features to allow for the maritime application. "What was missing were some of the steps in the laboratory to get the samples ready for sequencing," says Bob Feldman, production sequencing and collaborations manager at Amersham. The application process, however, "shortens the whole process down to a matter of only about a day, so that you can collect your organisms, make your DNA and then basically just start sequencing right away. You don't have to spend another three or four days and another three or four more pieces of equipment to get things ready to go into sequencing," Feldman says. Both Cary and Feldman say this kind of research is part of a new way of studying creatures and their ecosystems in the field. Cary says he hopes to continue the research with more field analyses next November. The National Science Foundation funded the research. Although the expedition has ended, the expedition Web site is still online at www.ocean.udel.edu/extreme2001. 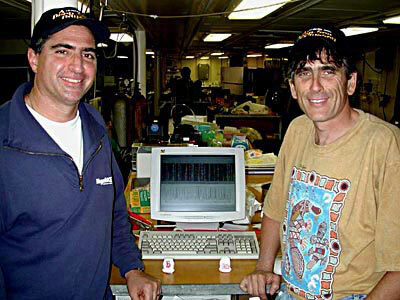 biologist and chief scientist for the Extreme 2001 expedition, in the lab on board the R/V Atlantis.